Jarett Metheny was appointed as the Fire Chief of the Battlefield, MO Fire Protection District in June of 2018. As a public safety advocate, the Fire Chief is responsible for overall planning, coordinating, and providing efficient and effective emergency services for the citizens of the District. Prior to his appointment with the Battlefield Fire Protection District, he served as an Assistant Professor in the Fire Protection and Safety Engineering Technology program at Oklahoma State University. He previously served over 20 years with the Midwest City, OK Fire Department and retired as a Fire Chief. He has a B.S. in Fire Protection and Safety Engineering Technology and an M.S. in Fire and Emergency Management Administration from Oklahoma State University. 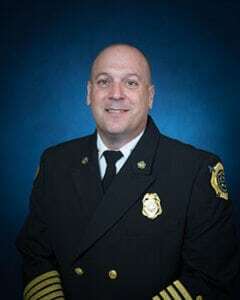 He is a graduate of the Executive Fire Officer (EFO) and is designated as a Chief Fire Officer (CFO) through the Center for Public Safety Excellence. He served as a facilitator and advisor for the Oklahoma Executive Fire Officer Leadership Program and served on the executive board for the Oklahoma Fire Chief’s Association. He is a member of the National Fire Protection Association and serves on the NFPA 1026, Standard for Incident Management Technical Committee. Chief Metheny is a member of the International Association of Fire Chief’s, International Fire Service Training Association, the Firefighters Association of Missouri, and the Queen City Fire Chief’s Association. Chief Metheny proudly serves with the men and women of the BFPD and the Board of Directors to ensure the organization is well prepared, trained, and equipped. Please do not hesitate to call or email for additional information, questions, or opportunities to meet.